It was decided to extende the conflict with Arvato-Qualytel to Orange, which is the main client of Arvato-Qualytel in Salamanca. If Orange knows about the working conditions of the people who take care of their clients, answer their lines, sell their products and solve complaints and customer incident, then Orange is an accomplice in exploitation. For this reason, a day of struggle at Orange outlets was called throughout the country. In Salamanca, there were 3 pickets at different Orange outlets which were positive, with a good turnover of people who support the union of the CNT-AIT in Arvato-Qualytel. In a small city with this model of employment, many people have friends of relatives who have been exploited by the company. We also have received news of solidarity actions. 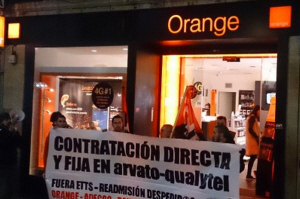 Unions of the CNT-AIT from places like Albacete, Cornellá de Llobregat, Elx, Granada, Iruña or Miranda de Ebro organized pickets at Orange outlets. We thank the unions of the CNT-AIT for the solidarity and we are conscious that their support is fundamental to a syndicalism based on self-management and mutual aid and we are sure that thanks to their help we will win and emerge reinforced from the conflict. We warn Arvato-Qualytel and Orange that the workers can be in solidarity with each other, beyond border and therefore we have called for a week of international solidarity with the rest of the IWA in January.